Globally, there are a large and growing number of researchers using biotelemetry as a tool to study aquatic animals. In Europe, this community lacks a formal network structure. The aim of this study is to review the use of acoustic telemetry in Europe and document the contribution of cross-boundary studies and inter-research group collaborations. Based on this, we explore the potential benefits and challenges of a network approach to identify future priorities and best practices for aquatic biotelemetry research in Europe. Over the past decade, there was an approximately sevenfold increase in the number of acoustic telemetry studies published on marine and diadromous species in Europe compared to a sixfold increase globally. Over 90% of these studies were conducted on fishes and undertaken in coastal areas, estuaries, or rivers. 75% of these studies were conducted by researchers based in one of five nations (Norway, UK, France, Portugal, and Spain) and, even though 34% were based on collaborations between scientists from several countries, there was only one study with an acoustic receiver array that extended beyond the borders of a single country. In recent years, acoustic telemetry in European waters has evolved from studying behavioural aspects of animals (82.2%), into more holistic approaches addressing management-related issues (10%), tagging methods and effects (5%), and technology and data analysis development (2.8%). Despite the increasing number of publications and species tracked, there is a prominent lack of planned and structured acoustic telemetry collaborations in Europe. A formal pan-European network structure would promote the development of (1) a research platform that could benefit the acoustic telemetry community through capacity building, (2) a centralized database, and (3) key deployment sites and studies on priority species requiring research in Europe. A network may increase efficiency, expand the scope of research that can be undertaken, promote European science integration, enhance the opportunities and success of acquiring research funding and, ultimately, foster regional and transatlantic collaborations. It may also help address research priorities such as the large-scale societal challenges arising from climate change impacts and assist the EU’s Marine Strategy Framework Directive via identification of good environmental status of endangered or commercially important species. Biotelemetry is now widely used to study the movements, interactions, and behaviours of aquatic animals  and is primarily based on three electronic technologies: acoustic, radio, and satellite telemetry . These tools have different characteristics and uses, but share a common foundation in that all require that a transmitter be attached to the study animal and a set of system-specific receivers be deployed to register signals from the transmitters. In the last 30 years, the rapid technological advancements in electronic telemetry have allowed scientists to monitor a wide range of species and animal sizes ranging from small salmon smolts (10 cm) to blue whales (29 m), across freshwater, brackish, and marine environments [e.g. 3, 4]. The data obtained from these studies included not only the location of tagged individuals, but also information from a suite of sensors that were incorporated into the transmitters to report data on the animal’s 3D acceleration, physiology (e.g. heart rate, tailbeat, stomach pH), or chemo-physical parameters of the surrounding environment (e.g. depth, salinity, temperature, dissolved oxygen) [1, 5, 6]. The use of animal-borne telemetry sensors has also allowed scientists to gather ocean observation data remotely and at affordable costs , leading to a better understanding of the oceanographic processes and the effects of environmental variables on the movements and distribution of marine species [8, 9]. Thus, the information obtained via animal telemetry has allowed us to better understand the spatial ecology of key aquatic species and informed management and conservation efforts [7, 10–12]. In Europe, there are a large and growing number of researchers using biotelemetry as a tool to study aquatic animals. Yet, the European telemetry research community lacks a formal network organizational structure such as those existing in other regions, like the globally active Ocean Tracking Network (OTN) , the Integrated Marine Observing System (IMOS) in Australia , the Integrated Tracking of Aquatic Animals across the Gulf of Mexico (iTAG) , and the Acoustic Tracking Array Platform (ATAP) in South Africa . In the face of efforts to organize networks of researchers and infrastructures to foster large-scale biotelemetric studies in North America, Australia, and elsewhere, this paper reviews the published European telemetry studies to identify the benefits and needs for such an organized aquatic biotelemetry network in Europe. The aim of this paper is (i) to provide a review of the historic development of the use of animal biotelemetry, (ii) to quantify the contribution to date of cross-boundary studies and inter-research group collaborations, and (iii) to assess the benefits and challenges of a network approach from previous studies and link them with future priorities and best practices for research in Europe. To investigate the development of acoustic aquatic telemetry in Europe, we conducted a search on the Web of Knowledge using the keywords “acoustic telemetry” or “biotelemetry”. The query identified 1821 documents published over the past 26 years (1991–2017). We then refined our search by only considering studies on marine and diadromous species carried out in European waters (n = 180). For each paper, we gathered information on all authors, publication year, countries involved, geographic location of the study area, national waters where animals were tagged, habitat type, species, and the study objectives to provide a description of the community and the research that was underway. Although the first acoustic telemetry studies worldwide were published in the 1950s , it was not until 1972 that the first study was published in Europe . There was an approximately sevenfold increase in the number of acoustic telemetry studies published on European marine and diadromous species over the past decade (2007–2017; Fig. 1a). For comparison, aquatic acoustic telemetry studies have increased sixfold globally over the same time period . 75% of these European studies were conducted in five countries: Norway (30%), UK (12.2%), France (11.7%), Portugal (11.1%), and Spain (10%). The authors were based in a single country in close to two-thirds (64.4%) of the studies, in two countries in 25.5%, in three countries in 7.8%, and four countries in 2.2% of the studies. Yet, only one study had an acoustic receiver array that extended beyond the borders of a single country . The vast majority (95.6%; n = 172) of the studies were conducted on fishes, with only four studies (2.2%) on crustaceans, three (1.7%) on cephalopods, and one (0.6%) on marine mammals (Fig. 1a). Taken collectively, this work spans more than 60 different species. However, 87% (n = 157) of the studies addressed only a single species, and only five species were the subject of more than ten studies: Salmo salar (Atlantic salmon, n = 35), Salmo trutta (brown trout or sea trout, n = 24), Gadus morhua (Atlantic cod, n = 19), Anguilla anguilla (European eel, n = 19), and Diplodus sargus (white seabream, n = 11). 90% of these studies took place in coastal areas, estuaries, or rivers, with only a small fraction (1.7%) of recent studies venturing to the deep sea and none in the open ocean alone. In recent years, acoustic telemetry in European waters has evolved from studying purely behavioural aspects of animals such as home ranges, residencies, and movement patterns (82.2%), into more holistic approaches addressing management-related issues, particularly with a focus on the design and assessment of marine-protected areas (10%), tagging methods and effects (5%), and technology and data analysis development (2.8%; Fig. 1b). This trend aligns with global developments and advances in aquatic acoustic telemetry [1, 2]. Despite the increasing number of publications and species studied, the review reveals a prominent lack of systematic, large-scale acoustic telemetry collaborations in Europe. The one identified example of such collaboration that is published to date detected European eels at acoustic arrays in the Dutch Scheldt Estuary and Belgian part of the North Sea . However, unpublished collaborations do exist, e.g. bluefin tuna (Thunnus thynnus) tagged in the western Atlantic Ocean were detected by receivers on the summits of Azorean seamounts over the mid-Atlantic ridge (P. Afonso and B. Block, unpublished data). This lack of systematic, large-scale acoustic telemetry collaborations in Europe stems in part from a historic lack of a common data system to easily and efficiently share detections among researchers using compatible equipment. These findings illustrate the benefits of data sharing in a large-scale network. Specifically, there is a clear need for larger-scale, cross-boundary studies in Europe focusing on far ranging, migratory species such as European eel, Atlantic cod, Atlantic salmon, and Atlantic bluefin tuna. This need is even more stringent, considering that such species are a priority for sustainable management and conservation under European policies, including the EU Common Fisheries Policy (CFP) and Marine Framework Strategy Directive (MSFD). The extent of migrations and populations of European mobile species is currently unknown and provides potential for collaborative research opportunities [see 19]. This gap results in a substantial loss of opportunities (i) for data sharing among animal telemetrists, and between them and oceanographic researchers who use “animals as oceanographers” to gather ocean observation data, (ii) to integrate European scientists and research infrastructure at pan-European scales, allowing research on priority societal challenges such as the impacts of climate change upon valued species and the conservation of commercial and endangered species in the face of the EU Maritime Policy and Blue Growth agenda, and (iii) for scientists to increase efficiency and scientific reach by sharing resources, reducing redundancy, and increasing the geographic scales their research covers. One recent action that may foster change in this research landscape is a regional network. A pan-European tracking network would foster the same benefits gained from large-scale networks in other regions and enable the scope of telemetry studies to be expanded from small regional acoustic arrays to networks covering entire coastlines or continents. OTN in North America and IMOS in Australia have achieved such a scope and increased data capture, generating new knowledge of use to policy makers, managers, and the public [13, 14, 20, 21]. Nevertheless, large-scale networks also bring significant challenges, including significant losses or decommissioning of equipment due to budget reductions which could potentially influence the design and vision of such large-scale networks [14, 16]. Even though open access data are increasingly becoming a prerequisite for funding agencies, it is a challenge to convince all users of a large-scale network to comply with a common and rigorous data sharing commitment . Furthermore, all large networks required sustained funding, and maintaining such support over the long term is a challenge. The European tracking network (ETN) is an initiative embedded in the AtlantOS project, which aims to foster increased and sustainable inter-regional to transatlantic ocean observations. During an AtlantOS sponsored workshop to discuss the need and potential structure of an ETN for the enhancement of autonomous observing networks in the Atlantic Ocean in April 2017, attendees initialized four key actions to develop research infrastructure that would benefit the aquatic acoustic telemetry community in Europe: (i) capacity building and enhanced collaboration, (ii) creation of a centralized database and data system to house animal detections (oceanographic data are housed in National Ocean Data Centres) and distribute timely notifications of detections to registered users, (iii) the identification of key sites for new infrastructure installations, and (iv) the identification of priority species for telemetry research in European waters. An ETN may build scientific capacity by providing training, sharing hardware and data services, and coordinating infrastructure services. It may also support training of students and technicians, whose expertise in the future may ensure local capacity to develop study designs, deploy and service receivers, organize tagging operations, and meet international standards of data management. This training could be provided through courses or on-site technical support. Additionally, the ETN may seek to coordinate research efforts among scientists and institutions. The ETN’s data system may develop links to the European Marine Observation and Data Network (EMODNet), the Joint IOC-World Meteorological Organization Technical Commission for Oceanography and Marine Meteorology Observations Programme Support centre (JCOMMOPS), the Global Ocean Ship-based Hydrographic Investigations Program (Go-SHIP), and other systems in the future to provide information on available ship time, facilitate ships of opportunity (e.g. for receiver deployments and recoveries on oceanographic cruises), and map positions with easy-attachment opportunities for receivers such as wave and navigational buoys used by different institutions. Research efforts could also be optimized by identifying and promoting opportunities for stakeholder involvement in regional case studies. The ETN data management platform (http://www.lifewatch.be/etn/) currently developed by the Flanders Marine Institute (VLIZ) was identified as an opportunity to serve as the central data portal of the ETN. It would be a repository for metadata from tagging studies and receiver arrays, and detection data about tagged aquatic animals generated from research infrastructure provided by the ETN members (i.e. implemented key arrays and tagged priority species across Europe), and regional partner projects from universities, fishery agencies, and non-governmental institutions. Even though we concentrate on acoustic telemetry in this paper, benefits from synergies of an organized ETN would also be of value for other research communities such as satellite, archival, and radio telemetry. The system may also provide an interface to manage, explore, and download the data and metadata. The aim of the database would be to increase the scientific use of telemetry data by providing a tool for enhanced data sharing, standardized data protocols, and analytical tools. The data system would also provide an historic archive which can be used in the future to evaluate shifts in animal movements and distribution in the face of a changing world. We identified six key sites for the strategic placement of new acoustic telemetry arrays that would substantially foster pan-European biotelemetric research: the Strait of Gibraltar, the English Channel, the Danish Straits, Malin Head, the Bosphorus Strait, and the Strait of Messina (Fig. 2). These areas are ecologically important gateways for valued aquatic species that migrate between the different oceans, seas, and regions, and many of the species moving among them are of great commercial importance and/or conservation concern. Thus, equipping these areas with acoustic receivers may simultaneously maximize the research output and impact of the collected data. 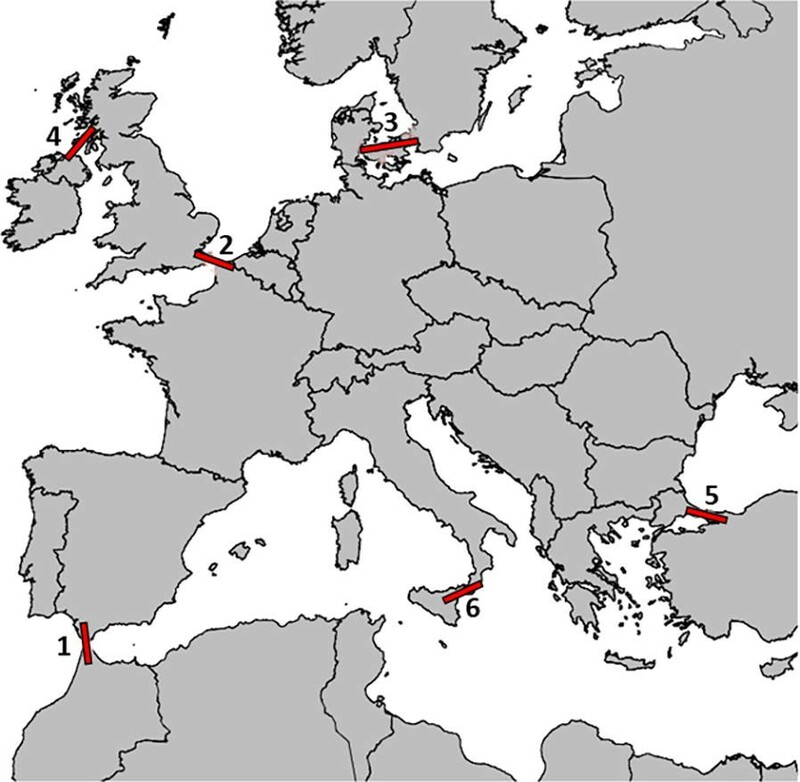 For example, an acoustic array spanning the Strait of Gibraltar between the Iberian Peninsula and Morocco would allow scientists to monitor the movements of key megafauna species such as bluefin tuna, sharks, sea turtles, and marine mammals, providing critical knowledge on the connectivity between their Atlantic and Mediterranean populations. A similar exercise was carried out concerning the species that would most benefit from the implementation of a large-scale acoustic network approach due to their large-scale movements, i.e. we identified corresponding species of importance based on expertise from researchers familiar with each of the regional key sites (Table 1). The flagship species presented here are a subset of these species that are likely to be detected by multiple key receiver arrays. Ideally, individuals of each of these species would be tagged and be detected by the core receiver research infrastructure provided by the proposed ETN, resulting in all data including detections becoming eventually available as open access data. Technological advancements in tag battery life in recent years would allow animals to be monitored for periods of up to 10 years and possibly beyond, allowing researchers to address variability of behavioural responses across an individual’s lifetime. The literature review of biotelemetry research in Europe clearly indicated an opportunity and a need for a formal pan-European network of researchers to foster large-scale aquatic acoustic telemetry collaborations and its potential affiliated benefits. Thus, the proposed ETN and its vision of implementing or connecting large-scale acoustic telemetry arrays would be especially beneficial for the management and conservation of highly mobile, migratory, anadromous, and marine species [e.g. 23–25]. Also important is the potential of these arrays to provide platforms for long-term data acquisition on essential ocean variables for oceanographic and other biological studies, such as the physical–chemical properties of the water, plankton counts, or anthropogenic sound pollution. This infrastructure should leverage research capable of addressing societal challenges and international commitments involving the conservation and sustainable management of endangered or commercially important species, such as devising conservation strategies to achieve Good Environmental Status under the EU’s MSFD or assessing and identifying strategies to mitigate the long-term impacts of climate change. These collaborative efforts should enhance the opportunities and success of acquiring research funding and may further develop transatlantic research opportunities. The lead authors David Abecasis and Andre Steckenreuter contributed equally to this work. DA, AS, and PA have conceptualized, performed the analyses, and written the manuscript. JR, KD, and FH provided expertise on data management processes and telemetry opportunities in the North Sea. KA, EBT, and LG provided expertise on diadromous fish species and on telemetry opportunities from a Scandinavian perspective. PB, NH, and AMW provided expertise on telemetry opportunities from a UK perspective and expertise on diadromous fish species. JA and FB provided expertise on telemetry opportunities from a Mediterranean perspective and inputs for the Strait of Messina. CM provided expertise on telemetry networks in the Atlantic Ocean. NB provided expertise on diadromous fish species. LB and FW provided expertise on data management processes and telemetry networks from a global perspective. All authors took part in the ETN workshop in April 2017 where the basis of this manuscript was prepared and contributed to the production of this manuscript by reviewing and commenting on drafts. All authors read and approved the final manuscript. This publication has been developed in cooperation with the European Union’s Horizon 2020 research and innovation project AtlantOS (633211). The database is developed by VLIZ as part of the Flemish contribution to LifeWatch project. We thank VLIZ for hosting the ETN workshop and AtlantOS to support the authors’ attendance. Currier R, Kirkpatrick B, Simoniello C, Lowerre-Barbieri S, Bickford J. iTAG: developing a cloud based, collaborative animal tracking network in the Gulf of Mexico. In: OCEANS 2015 - MTS/IEEE, Washington, Washington DC, 2015, pp. 1–3. https://doi.org/10.23919/oceans.2015.7401864.